AaronSales is your your marketing, branding and promotional product source! Search for products by typing in a keyword in the white box in the blue bar above or click on "Catalog" and go to the next page. 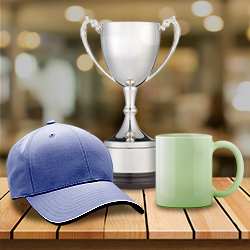 Our goal is to provide you with the best solution for your promotional apparel & product needs. Serving customers across the southwest since 1984 we have experience and expertise to make you and your business look good. We love to embroider and screen print apparel, including polos , tee's, hats, jackets, safety apparel and other items including totes, backpacks and golf bags. Your business cards, decals, labels and just about any other product may be branded with your promotional or informational message. We look forward to serving you, please contact us.